MOVING DAY. HERE WE GO! TWO DOWN :: NOT TOO HARD TO BUILD, ACTUALLY. I WAS CONSIDERING 5 AT ONE POINT - LET'S SAY EDITING WORKS. GOT RID OF THE CARDBOARD BACKS WHICH REALLY OPENED UP THE ENTIRE ROOM AND SLOWLY FILLED IN THE SHELVES. PRETTY MUCH DONE | TONS OF PERSONAL GOODIES ARE ON DISPLY FOR ME TO ENJOY! HANG MY INSPIRATION PRINT BETWEEN THE SHELVES. JUST BECAUSE I LOST THE WALL DOESN'T MEAN I CAN'T HANG FRAMES, RIGHT? MY FAVE NYC PHOTO IS ON DISPLAY (see it here), AS WELL AS MY NEW EBAY TYPEWRITER, OWL BOOKENDS, STACKS OF OLD ELLE DECOR MAGS, MY NYC SNOW GLOBE, OLD BDAY CARDS FRAMED THAT WERE FROM BOTH MY GRANDMOTHERS & MORE. ok small space dwellers, I am excited to share one of my new and very fave small space DIYs that I finished last week in my new small space - built-in units. For the first time ever, I live in a space that is wide enough to accommodate this look and I went for it and couldn't be happier. And it's a super affordable look that you can easily recreate in your own home. 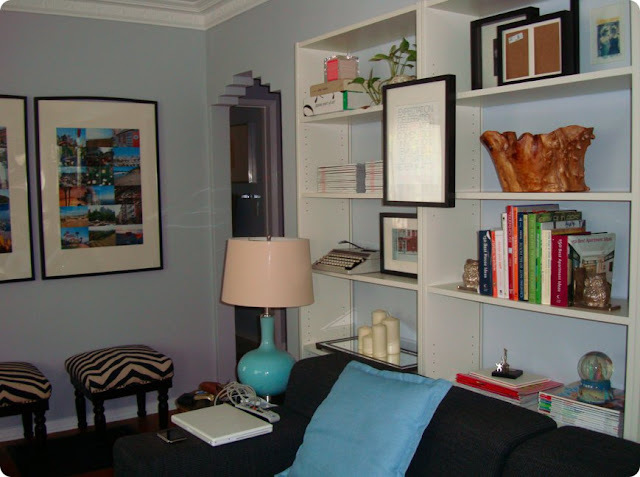 I knew that I wanted to create built-in units, or the appearance of them, to hold most of my accents, books, decor. Plus I knew the height of the bookcases really allow the space appear bigger by creating balance with the pretty molding and the curtains on the opposite wall. A run to Ikea and 4 Billy bookcases later, I slowly built them and got them up and behind the couch. After considering the cardboard back of the bookcases, I decided to give 'em up so the gray walls could shine through and also make the space feel bigger. 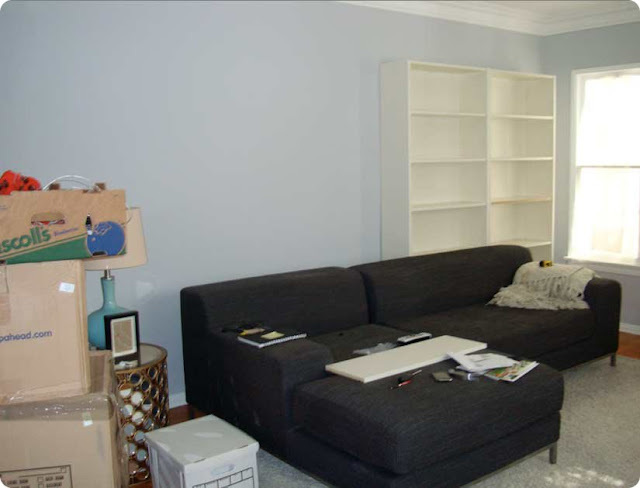 I am definitely happy with the look of the room and am looking forward to adding new books and photos to my built-ins. 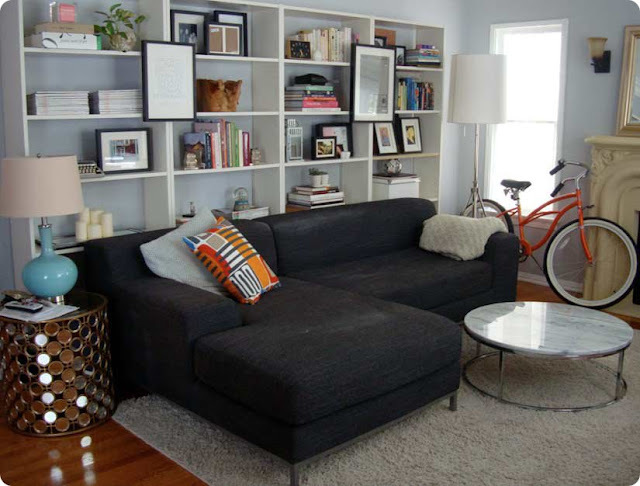 Have you created your own style of built-in units in your space? Share your story. Take a look above at photos I snapped of the work-in-progress (and it still is a bit of a work-in-progress adding things to the shelves) and click here to see more posts about setting up a small space from a small move. I like the book cases. As a renter, i have used this technique over and over again. Sometimes its fun to trim out the book cases or amp up the backdrop with another color or wallpaper or the like. I was considering wallpapering or painting the backs of the bookcases but with four in a row - it felt too much. for me, leaving the backs off really works and opens up the wall of built-ins. 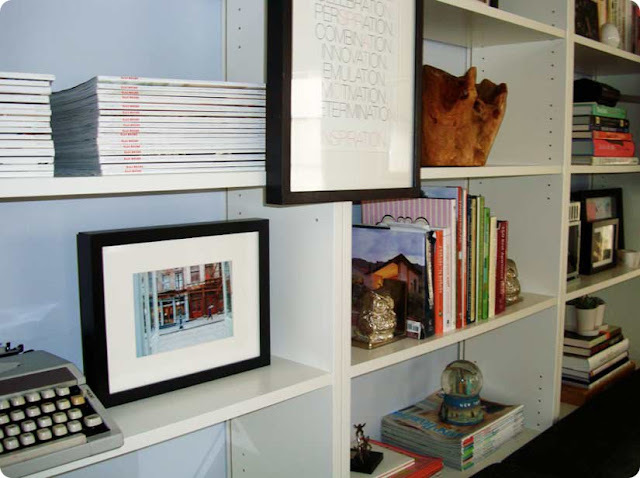 How did you hang the pictures between two shelves? The whole thing looks awesome. Nice going! My past two apartments had really wide front halls, and in both, I was able to create walls of books. 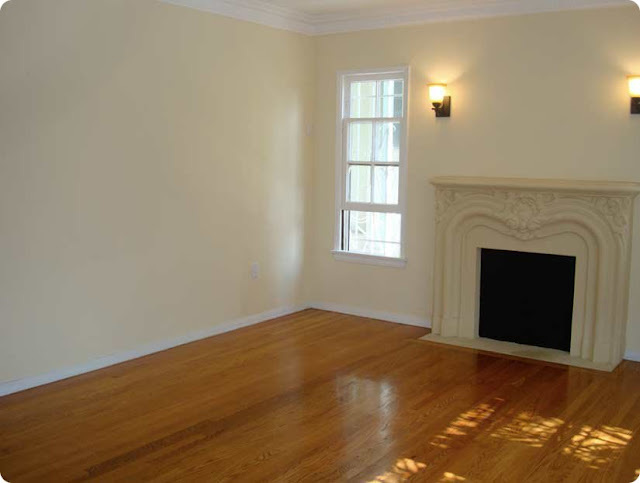 My old place was a weirdly bisected 2-room studio with this strange empty 8x12 space right in the middle of the front door, living/kitchen area, bedroom, and bathroom. (Keep in mind the "kitchen" and "living room" were 5 sq.ft. each!) I was able to make this awkwardly huge empty thing at the heart of my apartment a fabulous library. In my current apartment, the front hall is about six feet wide and 20 long, so I have 15 feet of bookshelf wall. ohhh would love to see the 15 ft bookcase. It's definitely opened up this space. I am excited that I could actually do this. I wasn't ever able to in past apts. Damn skippy girl! You rocked it, looks wonderful, and you are right, taking the backs off was brilliant. Marvelous! Taking the back off the shelves was smart. You did a great job balancing things you use and decorative items you enjoy! Do you have brackets of some sort to connect the bookcases to the wall? I would worry about them tumbling down. I did bracket them to the walls since they lost some stability when I ditched the backs. to be honest, they are still a bit wobbly - they are ikea :) but they work and they actually have a slight curve on the bottom to accommodate molding, which i have so it works! I'll throw up a photo to show you. Fantastic! Thanks so much for sharing it with us. You have a great place there. Where, where, where in the world did you get that side table? Is it mirrored? I absolutely LOVE it!!! I want one!!!! p.s. 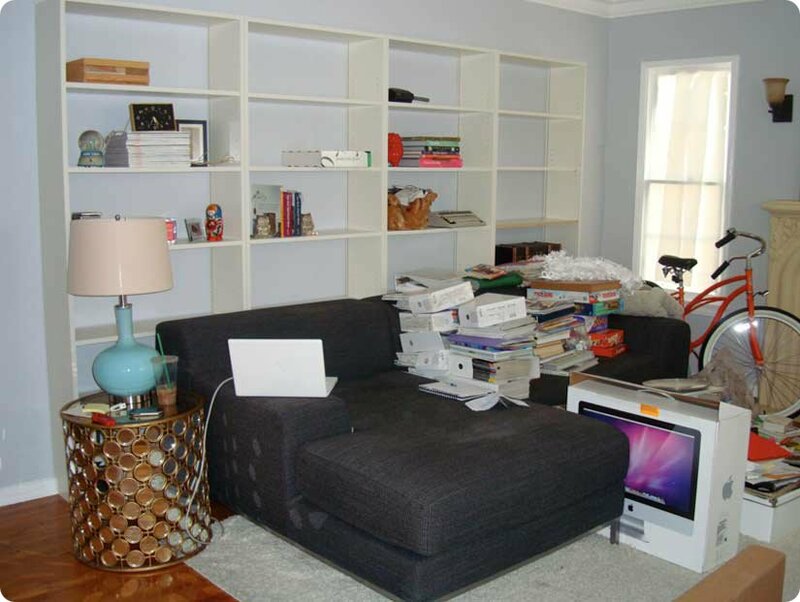 just came across your blog via CasaSugar! I would love to know where you got your round marble top coffee table please. Just found your blog through AT - your new apartment looks lovely! I'm preparing for a move myself - from NYC to Austin. 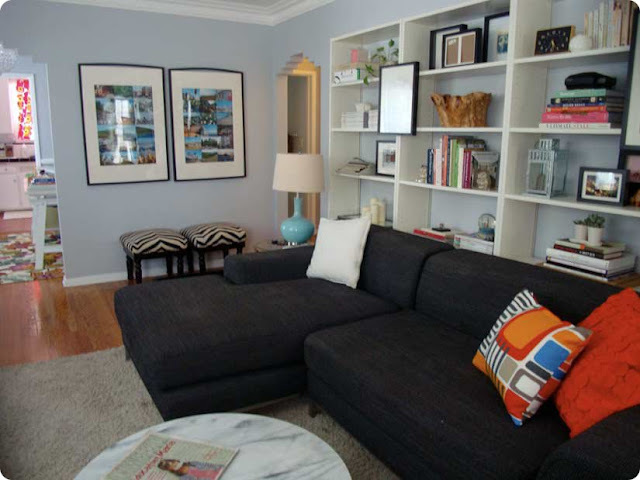 I'm toying with a gray and pale blue color scheme in the new digs - what paint colors did you use? the coffee table is one of my new purchases, special for this apt and part of my budget - smart round table from CB2. For stability, I'd put a small "L" bracket underneath the center of each shelf, attached to the wall... otherwise those IKEA shelves will come tumbling down under the weight of the books and such! Love your place! Where did you get your sectional sofa? I really love it! I am moving into a tiny studio in Boston and own waaaaay too many books. The only thing is, I have lots of allergies and want to avoid particleboard because it's bad for you. 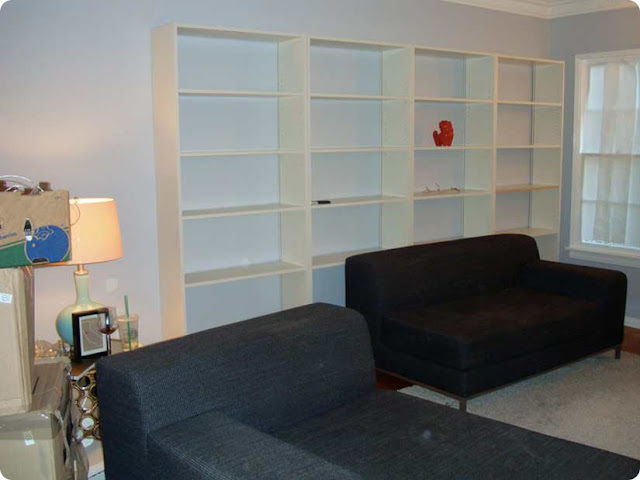 Any ideas on where/how to do this but with slightly better quality bookshelves?